Stanford University holds a special place in the sleep medicine community. Literally. A Stanford dorm named Jerry House was the location for ten years worth of summer sleep camps. It was at these camps that clinical protocols were written. Protocols still used today. 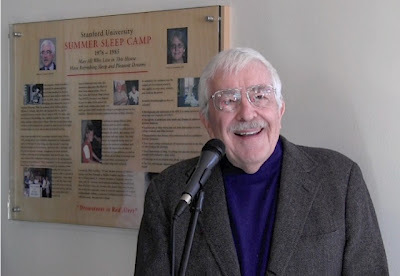 Stanford’s Jerry House was recently honored with a plaque commemorating these summer sleep camps. The dorm remains in use by students. On Jan. 28, a number of sleep pioneers, original volunteers and guests converged for the celebration. William Dement, MD, PhD, (pictured below next to the plaque) was in attendance. Dr. Dement is sometimes referred to as The Father of Sleep Medicine. He established the Stanford Sleep Disorders Clinic and Research Center in 1970. Also on hand was Mary Carskadon, PhD. From 1976 to 1985, Dr. Carskadon focused the Jerry House sleep camps on daytime sleep function. Volunteers from the local community had their sleep and wake times manipulated. This was something groundbreaking. Up until that time, sleep studies were conducted at night. The result was important data on sleep restriction and sleep deprivation. All of this is explained in the new plaque. “May All Who Live in This House Have Refreshing Sleep and Pleasant Dreams,” the commemorative plaque states. How did Jerry House get its name? Originally, the dorm was called Lambda Nu. The resident chef, Sandy, has been cooking there for 30-plus years. And her favorite musician is Jerry Garcia.